In this tutorial I am sharing how to create a table in Oracle Database using TOAD for Oracle Software. A table is a database object created by users to store data in the form of rows and columns. A table is the basic unit of storage. Table can be created at any time, even while users are accessing the database. A database table consists of column that needs to be defined when creating the table. Table can have up to 1,000 columns. A table must conform to some standard database object-naming conventions. Follow the given below steps to create table in Oracle Database using TOAD software. 1) Connect to the schema. 2) On Database Menu click on Schema Browser option. 3) In Schema Browser click on Tables tab. I am connected to Oracle Database through SYS schema therefore default tables shown on Tables tab. On Tables tab there is a create table button, click on that option to create new table. 4) Schema by default selected, enter table name and create columns using selection of Standard option. 5) Click on Physical Attributes table and select Tablespace for your table. 6 If you want to view the script of create table then click on Show SQL button. 7) Click on OK button to create table. 8) Verify your newly created table by entering table name within ( * ) in shown tab. In a database management system, a stored procedure is a set of Structured Query Language (SQL) statements with an assigned name that's stored in the database in compiled form so that it can be shared by a number of programs. The use of stored procedures can be helpful in controlling access to data, preserving data integrity and improving productivity. The Oracle PL/SQL language allows you to write procedure to centralize the business logic and store the code in the database. I have created the following Stored Procedure on Oracle using TOAD. This particular Stored Procedure will Insert a Customer to the Customer Table. For the sake of simplicity, Customer Table contains only 4 columns (Customer ID, Customer Name, City and Contact No). In this post I will show you how to create Oracle stored Procedure using TOAD. Connect to Oracle Database using TOAD. 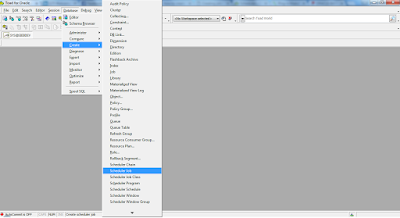 Click on Database menu and open Schema Browser. Scheduler is a process which runs programmed jobs at scheduled times. This process wakes up at the specified time and runs automatically. A package is a group of procedures, functions, variables and SQL statements created as a single unit. It is used to store together related objects. A package has two parts, Package Specification and Package Body. Package Specification acts as an interface to the package. Declaration of types, variables, constants, exceptions, cursors and subprograms is done in Package specifications. Package specification does not contain any code. Package body is used to provide implementation for the subprograms, queries for the cursors declared in the package specification.